Remote, home-based or outwork becomes more and more popular Worldwide nowadays. 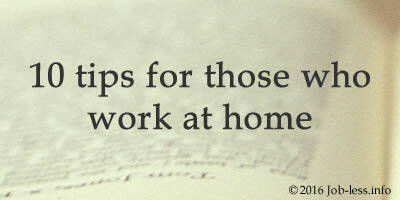 We are about to publish 10 rules which would help you to make your work at home more successfully and let you don't spend too much time on it. 1. Separate your working space from the relaxing atmosphere of other parts of the house and establish the accurate schedule of work. From the viewpoint of psychology, it helps you to enter a working rhythm easier and not to look aside on household chores. 2. Observe a home dress-code. Don't wear pajamas and dressing gowns. It is much better to get dressed, to wash, to have breakfast and only then to get down to work. 3. Close a door to the room in which you are working. Even slightly opened, it seems to be inviting our household to come in and chat. 4. Put your work table in order. However paradoxically, it helps to keep order in your head and to increase efficiency of working process. 5. Switch off phones, ICQ, Skype, close down Facebook and notices of new mail messages. If your work is not directly connected with the Internet, it is better to disable and it too. 6. Try to interrupt on a 15-minute break in each hour. It repeatedly increases quality of your work. 7. It is very important to stop in time. If a planned part of the work has already been done, don't sit in the workplace! It can influence on quality of work only to the worst side and as a result, you will feel ordinary tiredness. 8. If a large part of the working time passes behind a computer's monitor, on the day you should drink at least two liters of water. In fact, the long sitting at the computer results in dehydration of organism. 9. To work while listening to the music should be only if it is non-intrusive and light as a background and raising your spirits. 10. The amount of work should be correctly distributed during the working week. First of all, it will help to avoid works involving all hands. And secondly, will limit number of working hours, leaving more time for your private life and household cares.